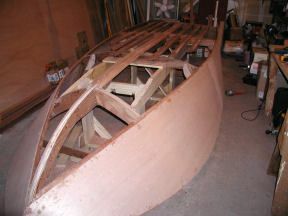 I am sending you and Glen-L a couple of pictures of my Zip boat frame. It is coming along nicely. The frame is all Mahogany fastened together with epoxy, silicon bronze and stainless steel fasteners. Both the chine and the sheer are laminated. 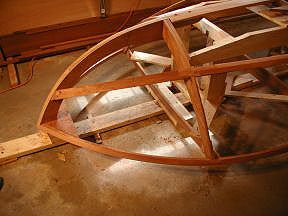 I enlarged the Knee to add more reinforcement to the transom as I will be putting a new Evinrude 50 HP motor on this craft. 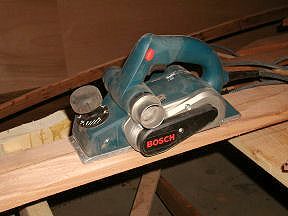 I purchased this power planer and used it to plane the keel, chines, sheer clamps, transom edge and stem. I can't imagine doing all that planing by hand. As soon as I get all my metal fasteners installed I will be ready to put on my Mahogany plywood planking. I purchased all my lumber and plwood from Boulter Plywood in Boston. They were very nice and helpful. I would recommend them to anyone. They were the only company I could find that sold 16' sheets of plywood. 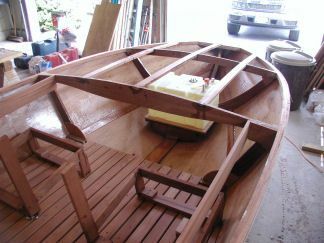 Thank you Glen-L for the wonderful plans, the advise regarding the transom modification and the supplies. My cramped little space has made it difficult to install the side planking. Crawling around the concrete garage floor on my hands and knees is not easy for a 65 year old man. But, I did it! 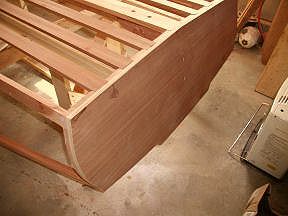 I had to wet the bottom planks with towels soaked with hot water to bend them into shape. I pulled them into position with clamps and allowed them to dry before applying the epoxy and screws. I am now in the process of applying the fiberglass cloth using laminating epoxy. 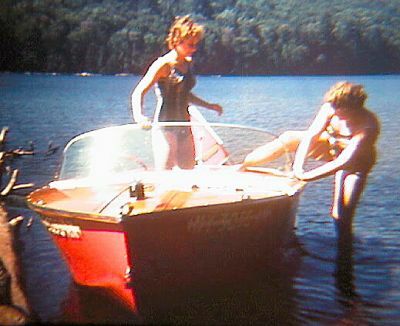 This is a Lugar boat kit I built in 1959 when I was in high school. It had a Scott-Atwater 40 HP motor. There was a "Zip" on the lake that same year. The Zip was faster. I wish I had that windshield for my Zip boat today. It was easy getting such parts back in those days. 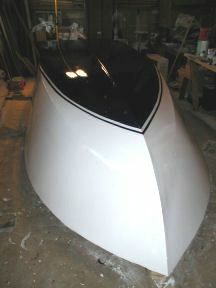 In this picture the fiberglassing has been completed and the hull has been painted. 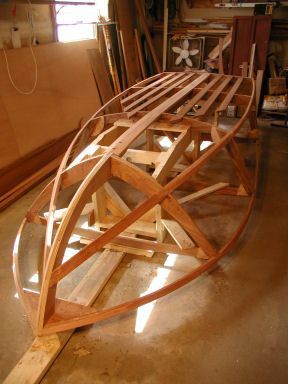 The boat has an additional keel which I added to give the craft directional stability. The picture does no do the hull justice. It looks beautiful. In this picture the carling and the half inch mahogany floor planking has been added. In the foreground one can see a platform for the fuel tank. 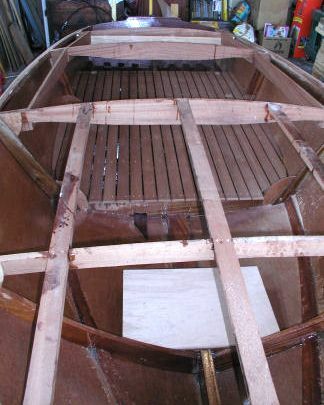 You can also see where I have modified the transom in order use a 20 inch shaft motor. I went through a great deal of consternation trying to decided whether to do this. I finally decided to make the change. Here the fuel tank platform and fuel tank can be seen. I decided to install the fuel tank in front in order to better balance the boat. The front seat framing is also visible here. All this has to be permanently installed. I coated the entire interior of the hull with epoxy to seal it from moisture. The epoxy is a little too shiny and so I plan to give it a coat of semi-gloss varnish when I do the floor. 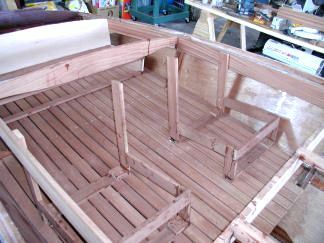 Here is another picture of the front and rear seat framing. These two seats have to be tied to frame number 2 and then that frame will be cut to create a walk-through to the rear seat. 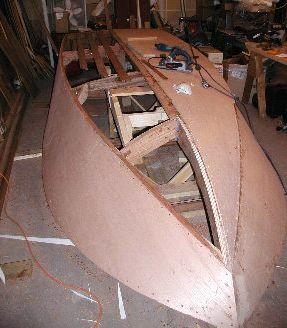 I planned to have the boat finished by August 10, 2007 as we have rented a camp in the Adirondacks. But, it is not going to happen. I hope to have it ready by fall.